1 Comment on Why Can’t I Find My Passion? You know, I spent a lot of years searching for my passion. I would think and think and think about it until my head felt like it was going to cave in. I would beat myself up because I just couldn’t find the answer. I would tangle my brain up into a multitude of ideas and options. What if I did this? Would that make me happy? What if I did that? Maybe that’s my passion? And yet this one singular passion would, time after time, elude me. It took me a long time to figure out where I had been going wrong. A lot of reading (which I love! ), researching, experimenting and soul searching led me to the answers. And granted there were lots of things that I hadn’t addressed, like figuring out what I really wanted, understanding my skills and what’s unique about me, but there was also something else that I was doing wrong. The very action of searching for just ONE single passion was clouding my judgement. I was so fixated on finding it, that I was unknowingly blocking a lot of potential solutions along the way. For most of us, there is no one single passion. And yes the Tiger Woods and the Richard Bransons of the world make us feel like we should be like them – but don’t you see? That’s the problem right there? Too often we look to other people and compare ourselves believing that their path is our path. And this is a recipe for disaster. You have a special gift – a talent, a unique ability. And this talent can be expressed in many, many different ways. It’s up to you to choose HOW you express it. And if you’re in a career that’s making you unhappy right now, I can guarantee you’re not drawing on this talent. In some way, there’s a mismatch. I want to show you how it IS possible to find success in a brand new career, in my new, free, 90 minute training: 3 Step Process to Find a More Meaningful Career You Love. The training’s 100% free and all you need to do is enter your name and email here: >>GET THE TRAINING. 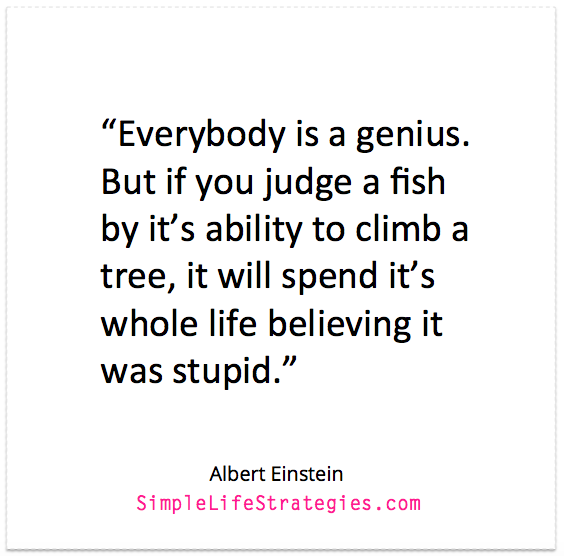 Are you a fish trying to climb a tree right now? Do you even know what you’re strengths are, what’s unique about you? Do you know what your inner genius is? Because if you don’t, then maybe it’s time to find out. Soon, I’m going to be making my ‘Find a New Career in 30 Days Program’ available as a self-study online course. It just bothers me too much to see people wasting their lives. I’m going to make this course very inexpensive because I truly want to help as many people as possible to find work that they love. I feel called to do so. And I know that not everyone can afford to work with a career coach one on one. So, this will be an option for people who are ready to finally find out what they want to do with their life, but at a very affordable price. I’ve helped tonnes of my private clients go through this program over the last few years and the results have been nothing short of phenomenal. You deserve to have that. I literally can’t wait to share this new program with all of you. If this article resonated with you, I would love for you to share it with anyone you know who is struggling to find their passion or purpose in life. PSSST: everyone who watches the training will get a free bundle of career resources including a step by step guide, strategic planner, personality tool and more freebies to help you find the perfect career for YOU. Register >>here my dear!